An adult female and her 3-year old daughter were rescued form the second floor of their burning Suitland home this morning. At around 9:30 am, Monday, June 11, Prince George’s County Firefighter/Medics were alerted to a house fire in the 3900 block of Coach Lane. Firefighters from the nearby Silver Hill Fire/EMS Station arrived quickly and encountered a 2-story, with basement, single family home with fire showing from the front of the house. The crew of four firefighters initiated operations with the Officer, Captain Russell Poe performing a check of all sides of the house, the wagon driver establishing a water supply and two firefighters stretching a hoseline into the house. Poe provided a radio return of conditions and entered the house with his firefighters. As the two firefighters were extinguishing the fire Poe could hear screams for help coming from another area of the house. He moved ahead of the hoseline and followed the calls for help to a 2nd floor bedroom. He entered the closed bedroom door and found an adult female with her 3-year old daughter. The occupants were exposed to smoke and heat and were experiencing symptoms of smoke inhalation and respiratory distress. Intense heat and thick smoke consumed the top floor. Poe alerted other firefighters of his location and that he located two occupants. Realizing additional firefighters were still responding to the scene and moments away Poe sheltered-in-place with the two occupants and provided his air mask to the 3-year-old female to assist with her breathing. Despite having a closed door the heat and smoke inside the room was increasing from the fire which was located almost directly below them in an adjacent room. Moments later, with the bulk of the fire extinguished, one of his firefighters, Matthew Tippett, was able to leave the hoseline to assist with the trapped occupants. Poe and the Tippett successfully removed the pair down the interior stairs and out through the front of the house. Medics and an ambulance crew from the Silver Hill Fire/EMS Station were already on the scene and quickly provided treatment on the scene for exposure to smoke and heat and transported to area hospitals for treatment. They were in “Good” condition and expected to make a full recovery. The fire started in a first floor room towards the front of the house and was started accidentally by a discarded cigarette. Fire loss is estimated at $45,000. A smoke alarm was found inside the home but determined to be non-working due to the age of the alarm. The smoke alarm appeared to be 20+ years old whereas smoke alarms need to be replaced every 10 years. 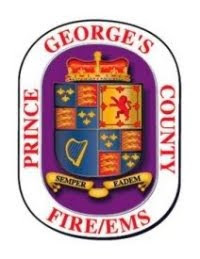 The Prince George’s County Fire/EMS Department cannot stress enough the importance of having a 10-year working smoke alarm on every level of your home, primarily just outside of sleeping areas. We further encourage everyone to sleep with their bedroom door closed and install smoke alarms inside of your bedroom as well. Additionally, plan and practice a home escape in the event of an emergency. During your plan identify 2 ways out of every room in your house.